The latest party craze sweeping the nation! You may have seen photobooths at weddings and parties, but now you can have the latest thing in photobooth fun. 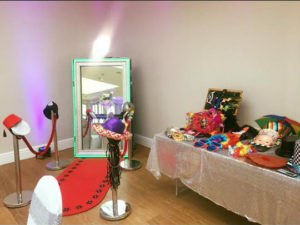 The magic mirror photo booth sits within a glamorous full length mirror, letting you and your guests show off your fashions in all their glory! To begin, simply, step up to the interactive display and press the touch screen menu to take your photo. Strike a pose then your pictures are printed in less than 10 seconds. Unlike older, closed photo booths, open booths like the magic mirror don't have hard enclosures. This means they can be used by wheelchairs and pushchairs or walking sticks, who would otherwise never be able to share in the photo booth experience. This also means the magic mirror is much more dynamic, with guests photobombing when you least expect it. Using the on screen pad, sign and customise your picture with emojis and fun designs to let your guests give their pictures a personal touch. Printed photographs are given their own custom backgrounds. Our design team will work with the themes and colours for your wedding or event to get the perfect backgrounds for your pictures. We also have backdrops to set up for your photos to be taken in front of. If you want to give your event something spectacular, book with us today!